The TBFC provides an affordable way to make this dream a reality." Tampa Bay Flying Club's mission is to strengthen the aviation community in Tampa Bay and to get rusty and new pilots up in the sky. We created the Tampa Bay Flying Club to fill a gap in aviation by allowing pilots to take advantage of the new 2017 FAA rulings. These new rulings have opened opportunities for rusty pilots to come back and breathe new life into the aviation community. The Club will help expand the field of aviation two fold: create new pilots and re-engage rusty pilots. The only way aviation can be propelled forward is through an affordable entry point and a community that embraces new pilots. With a large group of rusty pilots seeking to get back into the cockpit, we want to create the best environment to get them back into the sky. Located at Airport Manatee, the Tampa Bay Flying Club utilizes a turf runway that is situated on 22 acres and located within a parcel of 345 acres. There are more than 80 aircraft on the field in tie-downs and hangars. Nestled in the countryside, the airport is surrounded by crops and farmland, with coastal lands and beaches to the west. Plus, there is a spectacular view of Sunshine Skyway Bridge, Port Manatee, state parks and aquatic preserves where you can spot migratory birds and sharks. 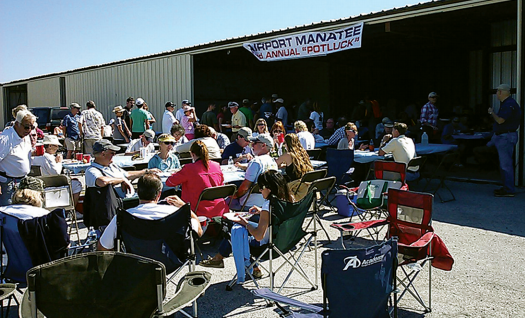 Airport Manatee's mission is to promote general aviation and support the flying community. Working together, we can continue the tradition of general aviation through an active interest in flying, maintaining aircraft, and staying current in piloting skills and flight-plan procedures. The airport's goal is to serve the general aviation community with excellence; to appreciate the community of pilots; to appreciate the spirit of human endeavor demonstrated by each person who learns to fly an aircraft and experiences the wonder of flight; and to promote respect for the privilege that is flight. Since 2005, Bill Burton has been fully committed to meeting the needs of the areas general aviation enthusiasts, student pilots, and private pilots from the Manatee Airport in Palmetto, Florida. Bill first got started flying in Maryland at the age of 14. Now many years later, he holds various certifications and has more than 33,000 hours in his pilot logs. With various ratings and certifications through to Aircraft Transport Pilot, he has flown many types of aircraft from light sport to heavy twins. Following many years as an instructor, he is a member of various organizations including the AOPA, EAA, National Association of Flight Instructors (NAFL), and the Society of Aviation and Flight Instructors (SAFE). He is a seasoned pilot whose credentials include: Airline Transport Pilot, Certified Flight Instructor, Ground Instructor with Advanced and Instrument Ratings, and A&P Mechanic.